I just went on a wild goose chase to see if there was a definitive answer to just how many different water lily paintings Monet painted during his lifetime - and came up empty. It feels like every major museum anywhere has a water lilies by Monet. This one, I don't even remember actually seeing, because we were actually at the Carnegie Museum of Art for a wedding reception, and while I remember going through parts of the museum, I distinctly remember hurrying (in silly shoes) to the gift shop to grab a magnet before it closed for the evening. 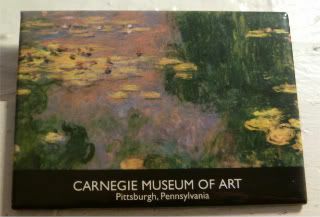 But this piece, Nymphéas (Water Lilies), is one of the jewels of the Carnegie collection, I'm sure. The information says circa 1915-1926, that it's one of six ginormous panels that he was working on up til his death in 1926. But, the detail on it is still pretty rather sharp - so it's even harder to believe that he was working on these with such detail, even though he'd already started losing his eyesight to cataracts. Gosh, what a tragic tale of the painter who lost his ability to see. You can see the contrast on this page, about midway down, comparing his Japanese bridges from 1897 to 1923. Anyway, I picked this magnet for today, because I meant to report back after my astounding visit to the Sotheby's preview exhibition, just before their Impressionist auction last month. Remember how I was stunned that I was standing in front of a $20 million painting? And that it was yet another of Monet's water lilies (Le Bassin aux Nymphéas), and how it was clearly unfinished? Yeah. That painting? Sold for not $20, but $24.7 million. Sheesh. Quick. Someone get me a brush.